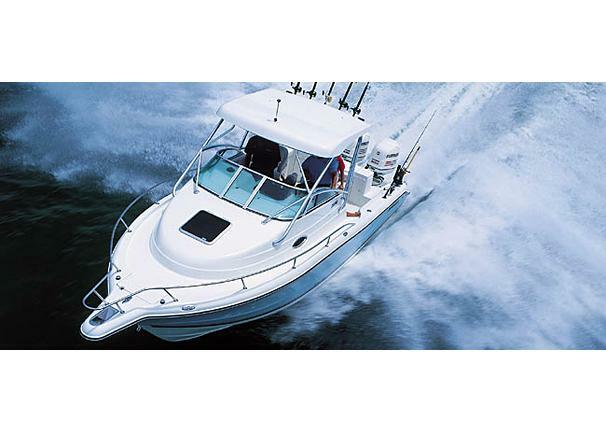 Boat Description The popularity of this handsome twenty-six foot walkaround is soaring as fishermen and their families discover the versatility of a deckplan that combines a large open fishing area with comfortable below deck accommodations. Topside, the 2690 is all-business from the well-equipped helm station to a spacious, uncluttered cockpit thats loaded with storage, and features a high output baitwell in the transom. The cabin area is complete with V-berth, galley, an enclosed head and even a fresh water shower  making the deep-vee Triton 2690 WA an ideal choice for an overnight canyon run or a family sleep-aboard.